Do you know a little one or two who needs to practice STOPPING and THINKING before acting? Fuzzy Foxes and a Moral? I'm in. Take me to the checkout! Add Clever to your library today! "I know my child knows the right thing to do, but in the moment, he just never makes the right choice. How do I get my child to stop hitting, pushing and screaming when he doesn't get his way? I just want to help"
As a kindergarten teacher this is something I hear from parents ALL THE TIME. Learning to control your impulses when you are little is not easy to do, but it is a skill that can be taught. With the right conversation and a lot of practice -- your child can succeed. A happy day tomorrow is a bedtimes story away! "This book really struck a chord with us since we also have a red head with a temper...he's just not a fox! All children will benefit from reading this book whether they are on the feeling or receiving end of scary emotions. Learning what to call the feelings we all have and what to do in the moment is a life skill and reading this social story when feeling calm and safe is the perfect reminder!" "This story was a perfect story to help with some social skills that my son struggles with." "What a wonderful book that promotes thinking about our words and actions. I highly recommend for any home or classroom as an exceptional read aloud to ignite discussion. It is rare to find a book that empowers change for the better for children who have challenges in social situations. Excellent choice." 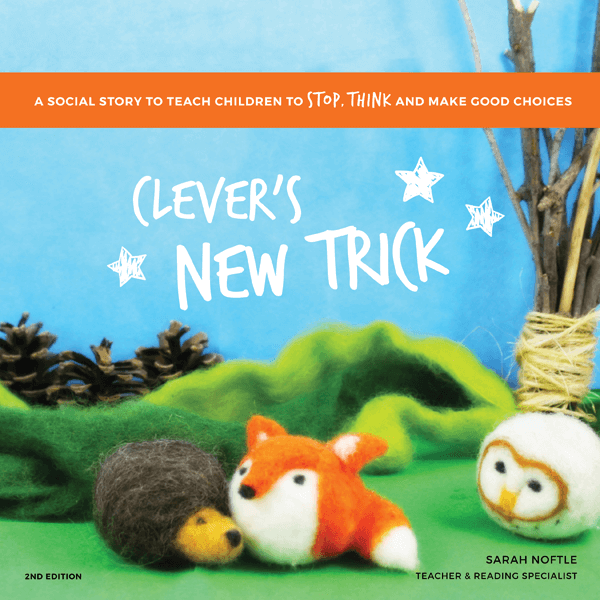 Clever's New Trick is also available for purchase from Amazon. Your choice of Print Book or Kindle.